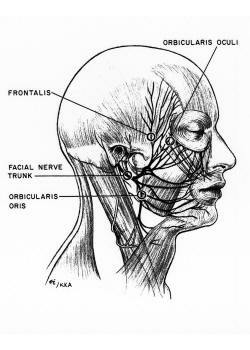 Facial Nerve Paralysis. Damage to the facial nerve may cause imbalance of the face at rest as well as distorted, asymmetrical facial expressions (e.g. smiling, laughing, grimacing, etc.). Functionally, facial nerve injury affects chewing, fluid retention while drinking, nasal breathing, corneal exposure, speech patterns, and communication skills. In children, facial paralysis most commonly occurs developmentally at birth or after brain tumor resection. Adults may experience complete or partial paralysis following an episode of Bell’s Palsy, acoustic neuroma, or traumatic injury. At rest, the loss of facial muscle tone causes downward droopiness of the brow, eyelid, nostril, lip, and cheek on the paralyzed side of the face. The functional loss of of the dynamic muscles of the lip and cheek result in abnormal lip and oral function affecting chewing, retaining fluid while drinking, speech patterns and communication skills. Weakness of the circular muscles around the eye causes incomplete eye closure (lagopthalmos), excessive corneal exposure and tearing. Paralysis of the small nasal muscles cause collapse of the nostrils during breathing. 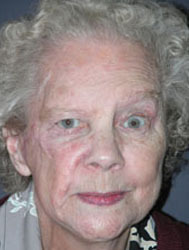 In the upper third of the face patients will be unable to wrinkle one side of their forehead. and the brow drops over the eye often blocking vision.. For this type of problem Dr. Jacono does a brow lift. Often we do an endoscopic forehead lift. The brow lift tends to reposition the droopy eyebrow and droopy forehead at a more even position with the other side often improving vision. Facial Paralysis Surgery Patient 1: This patient had right sided facial paralysis (left side of the picture) after removal of a right side facial tumor for cancer that caused her brow to droop over her eye and limited her ability to close her eye. This caused her eye to dry, and blocked her vision. 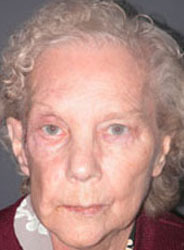 She underwent a browlift and a right upper eyelid gold weight implantation. Rather than elevating one side of the brow another option is to use Botox and even the two brows. If there isn’t too much sagging of the upper eyelid tissue that is blocking the vision on the injured side then the other side can be paralyzed temporarily with Botox (botulinum toxin) to match the injured side. 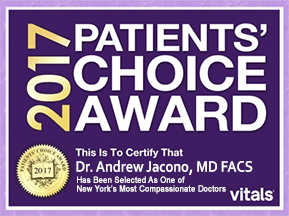 The most important concern Dr. Jacono has with facial paralysis is the functional protective actions of our facial muscles. Without the blink reflex and the ability to close the eye the cornea can become dried out and injured from exposure. This can significantly damage vision. A gold weight can be placed in the upper eyelid through a blepharoplasty (eyelid surgery) incision. With a gold weight, when you rest your eyelids the weight will close the eyelid for you. Since a different nerve opens the eye the ability to open the eye is still present. We use gold because it is very dense and non-reactive. Perhaps the most devastating loss is the ability to smile. This is especially heartbreaking to younger patients and their families who are embarrassed by the loss of communication skills and whose self-esteem is severely impacted by peer criticism. In the lower third of the face, the mouth and cheeks sag. The mouth must be able to close in order to talk, prevent drooling, whistle, pucker, and open in order to communicate, smile, display emotion, etc. 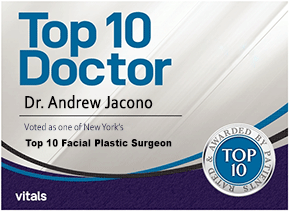 Dr. Jacono uses a variety of methods for repairing facial nerve paralysis around the mouth. 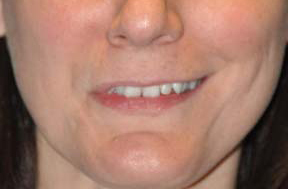 One stage regional muscle transfers from the adjacent scalp or neck are used to balance voluntary facial expression and restore a more even smile. 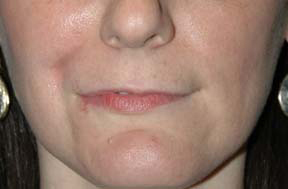 The active method of doing this is to transfer a muscle from the chewing muscles of the side of the face down to help elevate the corner of the mouth. The newest most revolutionary procedure for this today is the Temporalis Tendon Transfer Procedure which transfers a small tendon from the muscle used to chew to help the corner of the mouth move. This is all done through a small incision inside the mouth so that there are no scars. Facial Paralysis Surgery Patient 2: This patient had right sided facial paralysis (left side of the picture) from a bell’s palsy. Reconstructive surgery with a temporalis tendon transfer surgery. Notice the better balance of the mouth after surgery. Other times Doctor Jacono uses cross facial nerve grafts ( nerves harvested from an inconspicuous donor site on the calf) to “splice” into selected branches of the facial nerve on the normal side of the face. These grafts serve as a conduit for growth of the “electrical wiring” to the paralyzed side of the face. In cases of recent injury, the re-innervated muscles are reawakened by ingrowth of the new nerves. In long-standing cases of total facial paralysis, a second stage procedure is used to micro surgically transfer a fresh muscle from the inner thigh to replace the paralyzed smile muscle and receive the nerve impulse from the cross facial nerve graft. Outcomes are not entirely predictable, but in almost all cases facial balance and symmetry is restored by the static re-suspension and a substantial degree of voluntary smile activity and facial expression is achieved. Drooping of the cheeks is addressed with an endoscopic midface lift and a dropped jawline is addressed with a face and neck lift. A More Symmetrical Face. Although there are no absolute guarantees, these procedures have been very successful in restoring facial balance and a more symmetrical facial expression to dozens of patients who have come here from all over the country and the world. 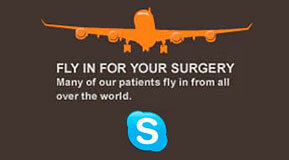 As you might expect, these procedures enhance the “quality of life” for children and adults alike. Facial expression, function, and communication skills that we all take for granted are dramatically improved!